EDINBURG – The students, teachers and staff at Magee Elementary School from the Edinburg Consolidated Independent School District recently celebrated the school’s second national award during a special ceremony at the campus. The National Association of Elementary and Secondary Education Act State Program Administrators (NAESPA) named Magee Elementary School a National Title I Distinguished School, recognizing the campus for its exceptional student achievement in 2018. Back in October, the U.S. Department of Education announced that Magee Elementary School was designated a 2018 National Blue Ribbon School and was among 349 schools from across the country receiving this prestigious award. “I like to put things in context. So, there are over 6,000 schools in the state of Texas that are eligible to possibly receive an award at this level. 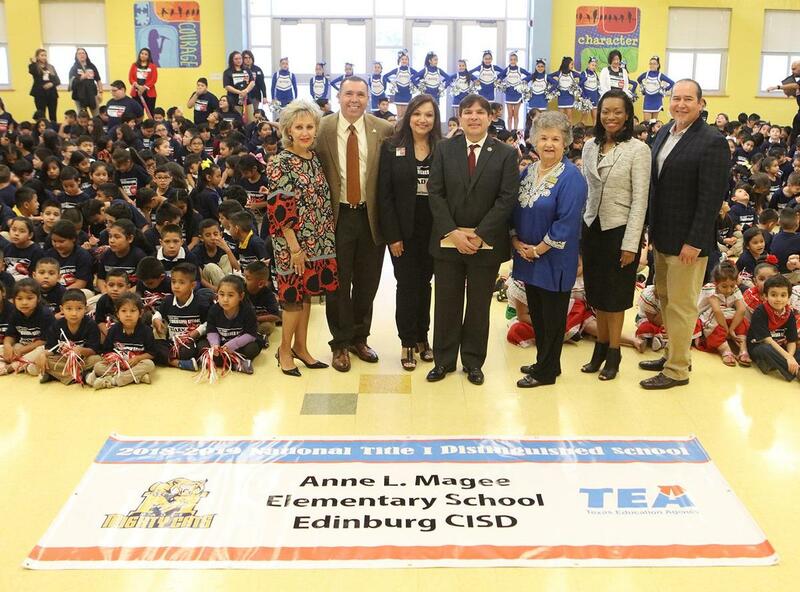 There is only one in the state and that is Anne Magee Elementary in the Edinburg CISD that actually was a recipient of this,” said Lauren A. McKinney, the Region 10 Title I Program Coordinator. Magee Elementary School Principal Marla Cavazos said this second national award within the same school year is the culmination of the hard work they all do as a team daily to ensure that their students are all successful. “To get National Blue Ribbon this year, which is one in 23 in the whole state, and then we get this honor that we were really not expecting – National Distinguished School for student achievement – for us in Edinburg to be selected for something so distinguished is quite an honor,” Cavazos said. 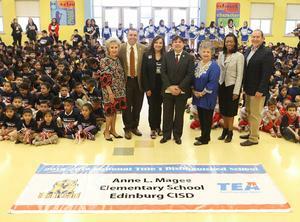 Magee Elementary was the only Texas school and one of about 100 schools throughout the country earning the National Distinguished award, which Congressman Vicente Gonzalez said was fantastic news. “Every one of you should take pride in the work and in the achievement that you guys have accomplished,” U.S. Rep. Vicente Gonzalez, D-McAllen said. Edinburg CISD School Board Vice President Carmen Gonzalez said this is an outstanding achievement for the district. According to NAESPA (formerly the National Title I Association), the National ESEA Distinguished Schools Program publicly recognizes qualifying federally funded schools for the outstanding academic achievements of their students. It highlights the efforts of schools across the country making significant improvements for their students. The program has been in place since 1996.